Eugene H. “Gene” Baughman, 94, a lifetime resident of Marshall County, departed this life Tuesday, Feb. 27, 2018, after a short illness. He was born to Bill and Blanche (Heim) Baughman on March 9, 1923. Mr. Baughman served in the U.S. Air-Force during World War II and flew 32 missions over Germany as a flight engineer and a top-turret gunner with the 487th bomb group in Lavenham, England. When he came home, he married Pauline Iris Maurer in 1945. They raised three children together and enjoyed 73 years of marriage in the Tyner-Walkerton area. He retired from Wheelabrator Corporation. 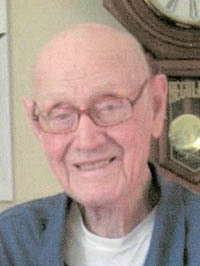 In his retirement years he enjoyed working for Century Link Telephone Company in Plymouth, flying powered parachutes and reading aviation history. Surviving are his wife, children: Ann Lynn LeHue, Plymouth; Linda (Marty) Lester, Lansing Mich.; and Lanny (Patty) Baughman, Walkerton; sister, Betty Metcalf, Plymouth; nine grandchildren and 17 great-grandchildren; and beloved dog, Missy. Proceeding him in death are his parents, four brothers: Paul, Billy, Barney, and Glenn; grandson, Jerimah Jacob “Jay” Baughman and great-grandson, Robert “Bobby” Daggett. Friends are invited to join the family at the Tyner Cemetery in Tyner, for a graveside service at 2 p.m., Sunday, March 4. A celebration of Life will follow at the Ponderosa in Plymouth.